If you are so minded this St David's Day, you might want to toast the patron saint of Wales with a dram of Welsh whisky. With two distilleries, the EU now formally recognises Wales as a whisky-producing country. 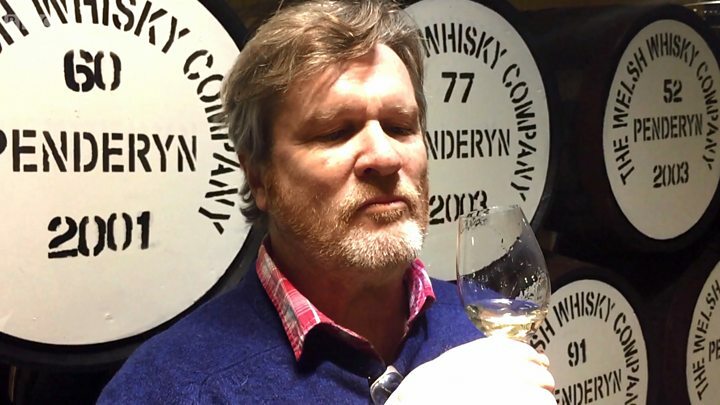 BBC Scotland's David Allison reports that with several more distilleries planned, Welsh whisky is back...with a bit of Scottish help along the way. Our Celtic cousins have distilled whisky in Wales since the middle ages, but not continuously. The late 19th Century temperance movement opposed the demon alcohol, and whisky production ended in 1910 when the Welsh Whisky Distillery Company closed its doors for the last time. In 1915, in an attempt to reduce the impact of alcohol on the war effort, the then Chancellor Lloyd George's Immature Spirits Act stipulated that whisky must be matured for at least three years. It led to the drink's reputation as a premium product, and the irony of a Welshman boosting the Scotch whisky industry. Welsh whisky wasn't produced again for almost 100 years until the Penderyn Distillery in the Brecon Beacons National Park in South Wales released its first batch on St David's Day 2004, exactly 13 years ago. It's gone on to be a multi-award-winning product, with a bit of Scottish help including a still from the McMillan company in Prestonpans in East Lothian. Penderyn's Sian Whitelock says they've learned plenty of good practice from the industry in Scotland in areas such as sourcing the best barley and barrels. The company's Jon Tregenna says the learning experiences are going both ways. "We have no plans to be releasing a 12-year, or a 15-year, or an 18-year," he said. "There is a rise in non-age statement whiskies and some Scottish distilleries are making advances in that direction as well, realising that out of this fashion maybe the old 12, 18, 25 might start to change a bit over the years." The company is planning a second distillery in two years' time, its copper stills to be located appropriately enough in the area of Swansea nicknamed Copperopolis from when the ready supply of coal for energy made it the epicentre of the world's copper industry. Penderyn is also aiming for a third distillery at a yet to be disclosed location in North Wales, while another firm Halewood International has also submitted plans for another whisky distillery also in the north near Bangor. But currently, the tiny distillery which actually gives Wales that all-important EU recognition as a whisky-producing country is based at a small organic farm in west Wales. The Da Mhile micro-distillery in Llandysul stands out for a number of reasons, not least because in an area where the Welsh language is king its name is actually Scots Gaelic, and means two thousand. It takes its name from an organic whisky that farmer and cheesemaker, and now proud distiller, John Savage Onstwedder commissioned from the Springbank Distillery in Campbeltown to celebrate the new millennium. The first locally-distilled Da Mhile whisky went on sale last November and promptly sold out. Mr Ontswedder says the scale is small but the aim is for the standard to be high. "One cannot survive in rural Wales by producing mediocrity. It won't work. So it has to be top quality," he said. The still was made in Germany, the home of schnapps, but elsewhere on the farm Scottish connections run deep. John Savage Onstwedder is himself half Dutch, half Scots and his son John-James trained at the small Kilchoman distillery on the west coast of Islay. Whisky in Wales is a growth industry, and while lawyers for the industry in Scotland will make sure that they'll never be able to call it Scotch, the regular awards demonstrate that the quality of the product is not in question. So from west Wales "Iechyd da!" - "Cheers!" "Dydd Gwyl Dewi hapus!" - Happy St David's Day.